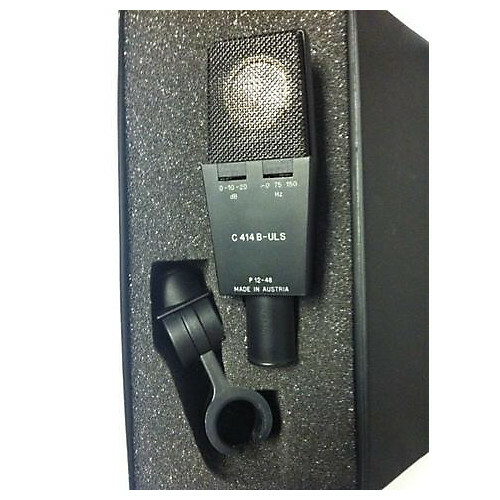 C 414 B-ULS, Large diaphragm condenser microphone from AKG in the C414 series. 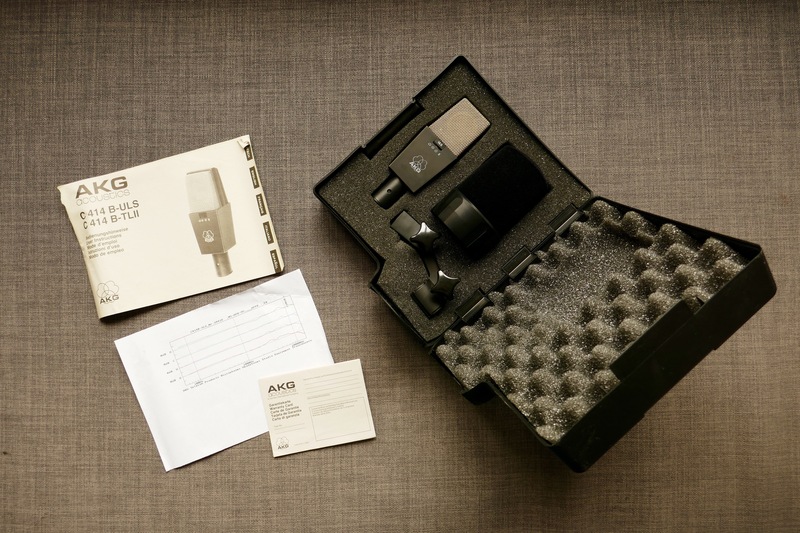 Product replaced by the AKG C414 XLS. Robert Coates's review"Theres' a reason this mic is considered a classic!" 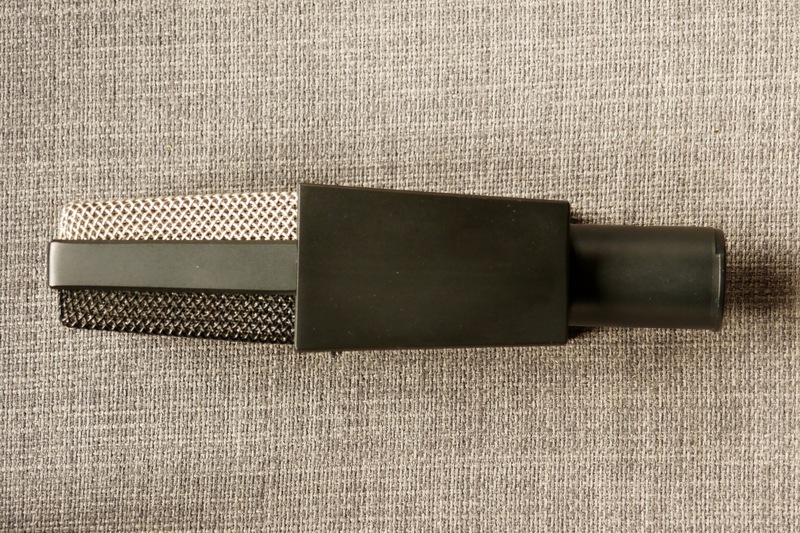 A Large Diaphragm Condenser (LDC) microphone, this mic has passed the test of time and even evolved into his C 414 XLS cousin. This one should be in any serious engineer's mic locker. It features 4 polar patterns: Omni, figure 8, cardioid and hyper cardioid. On the back you'll find an attenuation switch (0, 10 and 20dB) and a HPF (0,75 and 150). I've seen this mic in several packaging versions. Mine came with a sturdy and practical shockmount that holds the mic with a twist on the base and a slide-on pop filter, all of this in a lunch box plastic case with the foam cutout for holding everything in place. I use this mic on everything, mostly voices and overheads, but also on metals and guitars and as a room mic. It has never failed me in achieving the sound I wanted, but is wise to remember that mic position goes a long way in achieving the correct tonal balance. It's pretty flat without being 'boring', a quality that somehow similar counterparts such as Shure's KSM 32 has given me on past recordings. I've paired it with it's modern counterpart and there's no clear distinction when using it on cymbals. I'm not too fond of overly-crispy overheads, so this one does that just right. On metals like trumpets using it a bit far and on omni on a decent room you get all the throaty-ness that makes them sound real and expressive and the highs that let them cut through a mix. On guitars i'd rather use a dynamic like the trusty 57, but perhaps some styles could benefit from the higher detail. Voices vary and so does the mic to record them. 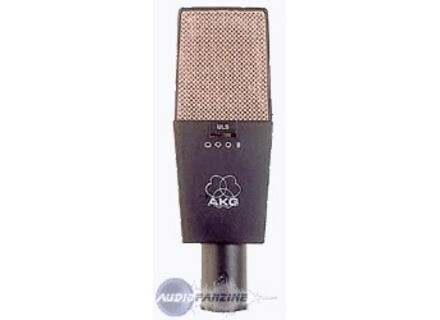 I own an AKG Solidtube and sometimes, specially for dull male voices, that one fits perfectly because it's higher high end, but most of the time I use this one because of it's higher fidelity in the upper mid range, and using it on cardioid and close miking I can get that proximity effect to show on deeper voices. This mic is expensive, BUT you can often find deals for it at really, really lower prices. I've seen it in the $1,500 USD range, specially one the modern version, but this one I found for $650! Bottom line: Get it if you find a good deal for it, you won't regret it and it'll make a frequent weapon of choice un your arsenal. 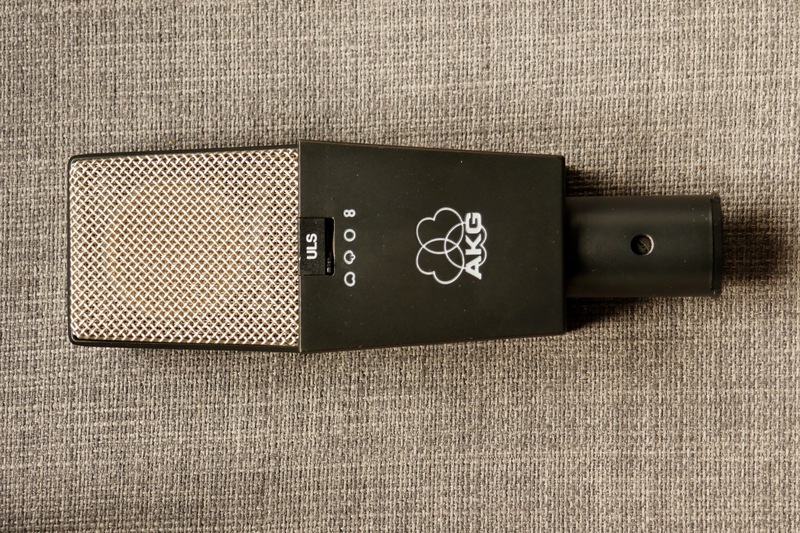 stompboxjon's review"expensive and worth it"
The AKG C 414b ULS is a mult directional condenser mic. The mic has a rather large diaphragm and is made to work well with all of your vocal needs. This mic is very professional and it was made just for that, professionals! You really don’t need to have this mic, its an older mic that I don’t think they still make it. Its seem in a lot of older studio’s that are staying vintage. You can also use it for guitars and brass instruments. I am not too sure how it can handle the thump of live drums though because I have never used it for that. This mic is very flexible and offers a wide frequency range. This is a mic that is top of the line for recording live instruments it really cant get much better than this mic. Sad thing is you will pay for it! This mic will cost you around 1100 dollars or so and that’s if you can find someone who is dumb enough to sell it too you. There is no way I would sell this if I had one! I would never have on of these for myself though because I record at home and just do some basic stuff. But there is a studio about 30 miles from here that uses this mic from time to time and I love the natural sound that it produces and there is no need for cutting a lot of frequencies off with it either. So if you can afford this mic and find someone who is selling it (good luck) I say get it now! You wont find a better mic that can be this versatile that is semi affordable. Most newer mics that have this kind of quality cost well over 1100 (the cost of this one). Find one if you can..
Large-diaphragms condenser mic with several polar patterns (Omni, Cardioid, Hyper and Figure-8. Flat frequency response curve, best adapted for the recording of instruments. I've been using it for one year. - Which features do you like the most / the least? I love its versatility, serious character, dynamics, extended response, response to transients, fidelity, density, cleanness, and sensitivity. I "don't like" its fidelity, density, cleanness, sensitivity, which make it very delicate to use in some situations. The first time I used it, I was very disappointed with the result. It's not a mic you can place just like that. You need to be careful, it demands you to pay attention to the environment where you are (background noise, etc.). The richness of this mic in the low frequencies can sometimes mask the rest of the frequency spectrum and make a recording seem heavier (especially when close-miking a snare, or bass guitar). I often find myself having to give this mic more air than others mics, in order to get the best out of it. Excellent as overhead mic, too. Used with the Recorderman technique, you will only need two mics to record drums convincingly. It wouldn't be my first choice to close mike a distorted guitar. I find it too "dull" for such applications where I prefer mics with more character, depending on the music style and the color I want for the recording. Could it be that I have never used it on the right guitar style? On the other hand, it's excellent as ambient mic for electric guitars, regardless of whether they are clean or distorted. The sound does not lie. It is really good on acoustic instruments. For the time being, I have been able to record clarinet, toms, acoustic guitar, small wooden percussions, etc… I think this mic loves wood. I have always been pleased with the results. The ULS is not the best for vocals, sometimes it works and sometimes it doesn't. It is all right for thin vocals or to give some weight to a vocal line. I rarely use it for vocal sessions, for speed reasons, mainly because in a home studio environment where you must record 5 to 8 songs in two days (at least in my case), I prefer to use a Chinese mic, which is more effective (at first sight, because when you take a closer look, the superiority of this mic is obvious) and sits better in the mix, besides being closer to what the musicians want. I hadn't tried any large-diaphragm condenser mics, except for the SE2200a, which is clearer, sometimes too clear, and has less body. I went for the 414 due to its reputation and chose the ULS for its "flat" response curve, unlike the TLII which has a slight boost in the high mids/highs. Very good if you consider that I got myself two secondhand models numbered 185000 in perfect shape, without a single scratch, no grease, no dirt, and all for the "small" amount of $1300, including accessories. Without a case, suspension nor windscreen, with wear and tear signs and many miles on it, I wouldn't pay more than $400 for each. - Based on your experience, would you choose this product again? I had one and bought another one, so yes, I already did.